If you don’t live in Chattanooga, Tennessee, you’ve probably never heard of Stringers Ridge—a 92-acre wilderness park, tucked in the hipster jeans pocket of North Chattanooga. Stringers, as we locals call it, is the epitome of an urban nature preserve – a 10-mile rollercoaster of well-maintained single track, hidden in plain sight. Thousands of motorists drive past Stringers every day, most have no clue that it’s there. Like many spots in Chattanooga, Stringers is rich in Civil War history. In fact, it was the site of the first Union invasion of Chattanooga. Who knew that 155 years later, this former war zone would host The Cannonball – an annual, last-runner-standing battle. The Cannonball was created by Joshua Holmes, race director and founder of Run It Fast and Run It Fast – The Club. 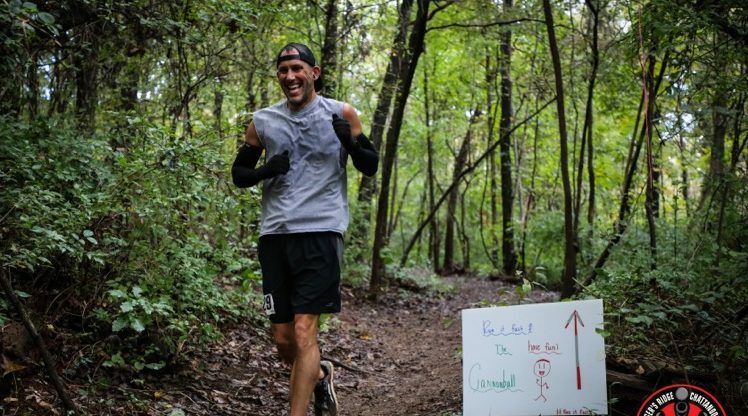 It is also managed by co-race director, David Pharr–pastor, Fleet Feet Chattanooga employee, veteran ultra marathoner and amateur air guitar player. I met Joshua in December 2015 at Trail of Fears, his original last-runner-standing event held each December in Jackson, Tennessee. At that time, I was a spectator and ultra marathon novice. Sure, I had completed The Barkley Fall Classic 50K, Stump Jump 50K and paced my boyfriend to a finish at the Pinhoti 100, but these races were finite. They had a starting line and finish line. I had never seen an event like Trail of Fears – a race that was potentially infinite as long as the participants were willing to continue. Needless to say, I was intrigued. Fast-forward to October 2018 where I toed the line of my second Cannonball. As Gary Cantrell (Lazarus Lake) describes his world-renowned, last-runner-standing event, Big’s Backyard Ultra, “The whole texture of the race changes when it doesn’t matter how fast you run, as long as you beat the time limit every hour.” This is the nature of the beast at The Cannonball. I arrived at the Spears Avenue trailhead at 7 a.m. and arranged my personal aid station. Like all Run It Fast events, the hour prior to gun time is a family reunion. The Cannonball was no different. At 8 a.m., off we went for our first trip around Stringers. We had one hour to complete the 4.3-mile loop. The hares prefer to take off and return to the staging area with plenty of time to rest before the next loop. The tortoises and I are a little more conservative. I learned in 2017 that when it comes to last-runner-standing events, faster is not always better. I planned to finish each loop with less than 10 minutes to spare. On race day, that’s exactly what I did. At The Cannonball, there are pros and cons to returning with more than 10 minutes to spare. Of course, one has more time to eat, drink, visit the restroom and change clothes. However, one also risks muscle cramping, a cooling core temperature and a loss in desire to return to the course. This is why I love this race. Obviously, it requires physical fitness and the trails at Stringers Ridge are not easy. While 600 feet of elevation gain per lap may sound benign, the peaks and valleys are not forgiving. Mental strength is essential to a successful performance at The Cannonball. Whether your goal is to complete one loop, two loops or 20 loops, you have to have a strategy. Each hour requires a fresh decision to continue, and that decision takes resolve. There are no fancy medals or shiny buckles. No cash prizes or paid sponsorships. At The Cannonball, we’re just runners in the woods, with a few hours to kill. I love it, and I’ll return every year. I ran 10 loops this year, which equates to about 43 miles. Last year, I earned second place female. This year, I earned third. But, at The Cannonball, the best part of the day is the camaraderie, meeting and exceeding personal goals and that shared sense of suffering. 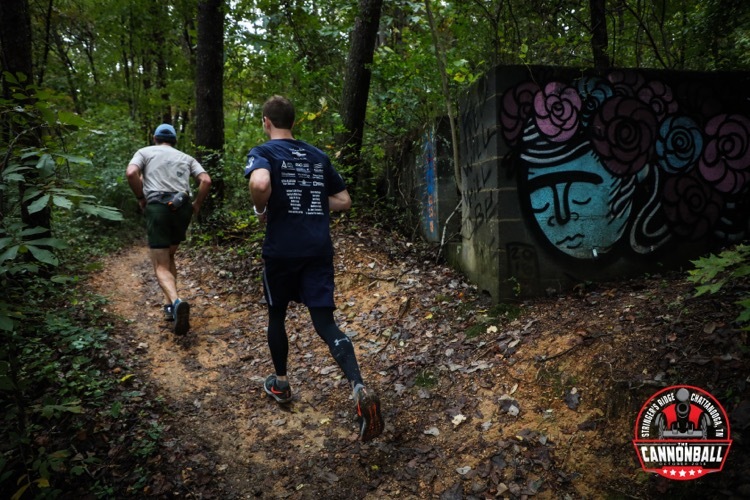 Some were proud with 8.6 miles, while others, like Chattanooga’s own Christian Thompson and Robby Jourdan, completed their first 100k distance and more. If you aren’t from Chattanooga, Tennessee, you’ve probably never heard of Stringers Ridge. But, next time you visit Scenic City, I encourage you to lace up those trail shoes and take on a Cannonball loop. You have one hour. Go.